New Autopsy Report Suggests Michael Brown Was Shot At Close Range : The Two-Way The St. Louis Post-Disptatch has obtained an autopsy report on the shooting of Michael Brown. It leaves a lot of questions about the shooting of the 18-year-old by Officer Darren Wilson. 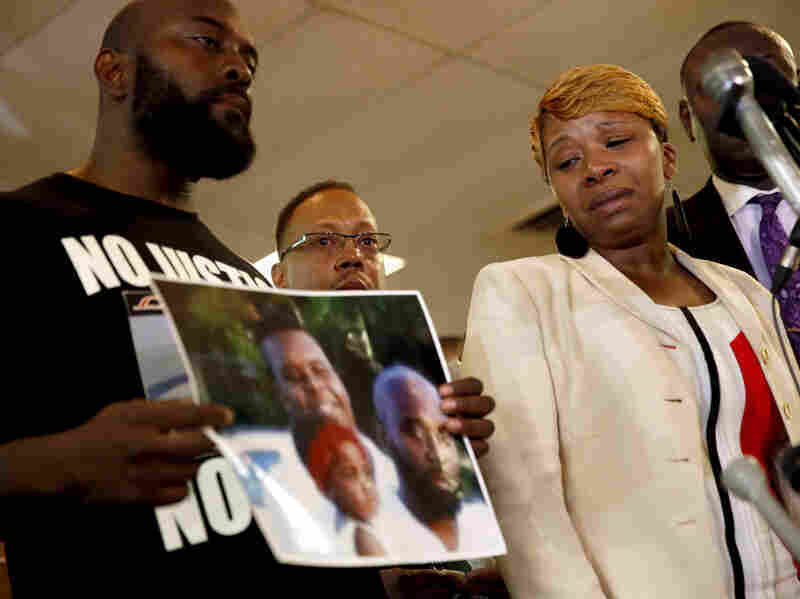 Lesley McSpadden, right, the mother of 18-year-old Michael Brown, watches as Brown's father, Michael Brown Sr., holds up a family picture of himself, his son, top left in photo, and a young child during a news conference Monday, Aug. 11, in Ferguson, Mo. The St. Louis Post-Dispatch has published the official autopsy report on the shooting death of Michael Brown, the black, 18-year-old whose death at the hands of a white police officer set off weeks of protests this summer and fall in Ferguson, Mo. The report suggests that Brown was shot at close range by Officer Darren Wilson. A toxicology report accompanying the autopsy report suggests Brown had marijuana in his system at the time of his death on August 9. The Post-Dispatch also spoke with other experts who say the autopsy report shows Brown was facing the officer when Brown was shot in the forehead. This contradicts witness reports that Brown was shot while running away from Wilson with hands raised. "We are not surprised by the information leaked last night by the St. Louis Medical Examiner's office. Several independent witnesses indicated there was a brief altercation between Michael Brown and Officer Wilson at the patrol car. What we want to know is why Officer Wilson shot Michael Brown multiple times and killed him even though he was more than 20 feet away from his patrol car; this is the crux of the matter!" An earlier, private autopsy performed at the request of Brown's family found that Brown was shot six times, with a fatal shot to the skull. That report left many questions unanswered, as the private examiner did not have full access to all of the crime scene. Officials at the Department of Justice say they will also perform their own autopsy. Earlier this month, the New York Times reported that Wilson testified two months after the shooting that he feared for his life just before he shot Brown. "The police officer who fatally shot Michael Brown in Ferguson, Mo., two months ago has told investigators that he was pinned in his vehicle and in fear for his life as he struggled over his gun with Mr. Brown, according to government officials briefed on the federal civil rights investigation into the matter. "The officer, Darren Wilson, has told the authorities that during the scuffle, Mr. Brown reached for the gun. The shooting has brought to the forefront simmering tensions between Ferguson and St. Louis' African American communities and the people that police those communities, as well as the poor socioeconomic conditions of many black people in the St. Louis metro area. Missouri's Governor Jay Nixon announced this week the formation of an independent commission to "study and make specific recommendations for how to make progress on the issues raised by events in Ferguson." Offer specific recommendations for making the St. Louis region a stronger, fairer place for everyone to live.